My favourite scribe Melanie Philips wades into the gobbledegook currently being presented as "climate science" pointing out the absurdities in the latest "dog ate my global warming" theories. 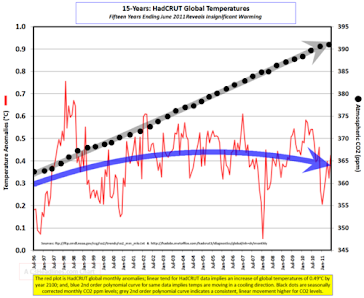 Desperate to explain the hiatus in warming warmists seize on any paper to keep their discredited theory alive and guarantee the next paycheck. Melanie incisively analyses the Slingo lingo and Professor England's attempts to repair the crumbling Global Warming edifice. So the Met Office is saying storms have been caused by the oceans being warm; but the Nature paper says global warming has paused because the oceans are cool. So are the seas –when they are not rising through all that ice melting into them – getting cooler or warmer? ‘Here we show that a pronounced strengthening in Pacific trade winds over the past two decades—unprecedented in observations/reanalysis data and not captured by climate models—is sufficient to account for the cooling of the tropical Pacific and a substantial slowdown in surface warming through increased subsurface ocean heat uptake. The extra uptake has come about through increased subduction in the Pacific shallow overturning cells, enhancing heat convergence in the equatorial thermocline. 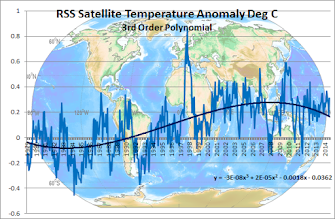 At the same time, the accelerated trade winds have increased equatorial upwelling in the central and eastern Pacific, lowering sea surface temperature there, which drives further cooling in other regions’. So the trade winds both warm and cool the oceans simultaneously! When the oceans are cool, they are really hot! Just like ‘climate change’ itself causes both heat and cold, floods and drought – uh, sorry, ‘extreme weather events’. A truly magical theory, no?